Montrose Community Connection | Colorado Mesa Univ. 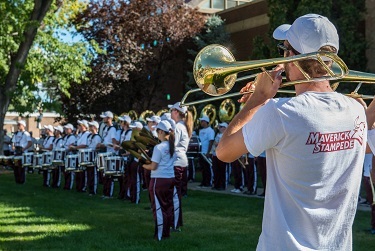 Just following the beginning of the Fall 2014 semester the entire CMU Maverick Stampede helped to open the newest Montrose Campus building with an orchestral bang! Community members, staff and students all attended. 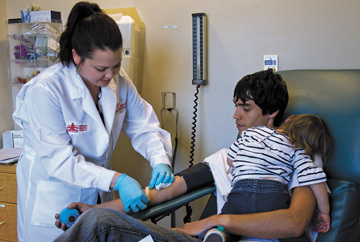 In conjunction with Montrose Memorial Hospital, Colorado Mesa University Montrose Campus students organized and participated in a successful blood drive (September 2014). Please visit the Financial Aid web pages for scholarship details. 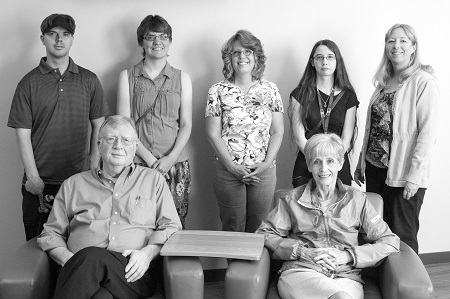 In June 2014, ten CMU-Montrose students were awarded scholarships averaging more than $1,800 each from the Doyle E. Burns Endowed Scholarship Fund. The 2014-15 recipients are (pictured left to right) Steven Allen, Samantha Main, Leia Edson, Casey Marolf and Karen Northrup. Seated are Jim and Sharen Branscome, community members that helped to spearhead the Doyle E. Burns scholarship fund. Not pictured: Jennifer Burris, Karis Scroggs, Colleen Thliveras, Bethany Hancock and Patrice Reed.